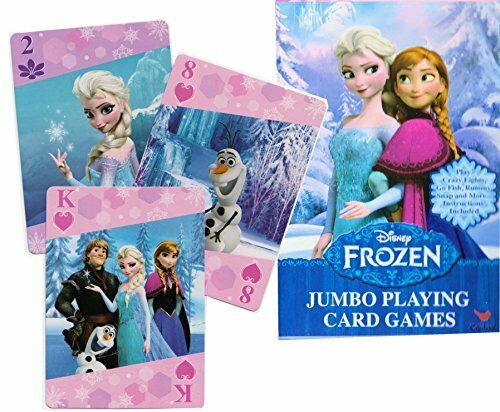 Enjoy your favorite card games with this fun set of playing cards themed to the movie Frozen. The cards come in a standard deck of 52 plus two wild cards. These are jumbo oversized playing cards, easy for youngsters to handle and read. The cards feature color images of characters from Frozen, like Elsa, Olaf, Anna, and Kristoff. Use these officially licensed cards to play classic games like Go Fish, Crazy Eights, Rummy Snap, and Memory. The deck comes with instructions for playing some card games.